His Apostateness, Benedict XVI, Antipope Emeritus, at least made an effort to mask his apostasy with his Hegelian dialectic and convoluted, ambiguous and simply intellectually dishonest efforts to distort, misrepresent and pervert the lives and teaching of Holy Mother Church's Fathers and Doctors and many of those she has raised to the altars for our veneration. His successor, Jorge Mario Bergoglio/Francis, is ripping away all pretense of caring for Catholic doctrine as he believes, preaches and practices an irenic form of religion that he promotes under the guise of his "humility," "meekness," "simplicity" and democratic spirit of egalitarianism and compassion. Bergoglio/Francis does not even believe that it is necessary to resort the intellectual gymnastics required of Joseph Ratzinger/Benedict XVI's philosophically absurd and dogmatically condemned "hermeneutic of continuity" to reconcile the immutable teaching of the Catholic Church with that of the counterfeit church of conciliarism. Jorge Mario Bergoglio/Francis just ignores any doctrine or ceremony he does not like as he is opposed to what he would dismiss as a "dogmatism" that divides men and a "sacrality" that places what he thinks are barriers between Our Lord and His people, who can belong to whatever religion they want as long as they serve the poor and are meek and humble in their bearing. Wherefore, strictly adhering, in this matter, to the decrees of the pontiffs, our predecessors, and confirming them most fully, and, as it were, renewing them by our authority, of our own initiative and certain knowledge, we pronounce and declare that ordinations carried out according to the Anglican rite have been, and are, absolutely null and utterly void. . . .
Francis the Head Citizen of the One World Ecumenical Church pay this no never mind. Who cares about Apostolicae Curae? 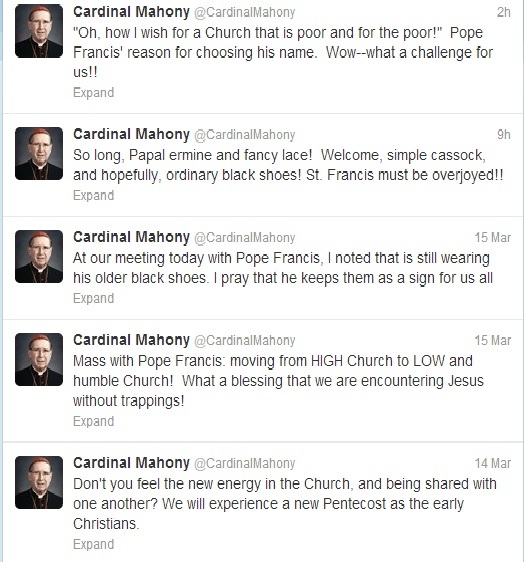 Remember, Mahony (see Corrupt Chickens Come Home To Roost In Roger's Nest Of Apostates and Conciliar Mud Wrestling) tried to promote Jorge Mario Bergoglio/Francis as the "stop Ratzinger" candidate at the 2005 conclave following the death of "Blessed" "Pope" Karol Wojtyla/John Paul II. He, the quintessential Americanist in the mode of James Cardinal Gibbons and phony, baloney "friend of the poor" while building his $200 million monstrosity, the Taj Mahony, alongside the Hollywood Freeway in Los Angeles, California, who shared a beach house for many years with fellow protectors and enablers of corrupt clergymen William Levada and Tod Brown (see "Liar, liar, pants on fire" by Randy Engel that deals with Levada's constant excuse of the disease that is homosexuality and effeminacy in the clergy as he has enabled them at every turn), is really pleased that the the doctrinal, liturgical and moral revolutions are back "on the right track" as he believes that they had been during the false "pontificate" of Giovanni Montini/Paul The Sick. Unfortunately for Roger Michael Mahony and his new "pope, Jorge Mario Bergoglio/Francis, the track that his counterfeit church of conciliarism leads nowhere but from its origin: Hell. All Bergoglio/Francis will do is to engineer the train down that track at a consistently faster speed than His Apostateness, Joseph Ratzinger/Benedict XVI, Antipope Emeritus, who was moving it along pretty fast in his own right, albeit he had to slow down at the curves and high mountain passes caused by his effort to "reconcile" Catholic teaching with conciliarism. This new apostate in Rome is just, as noted above, dispensing with all of that intellectual pretense and facade. The tragedy is that there will still be many "traditionally-minded" Catholics attached to the conciliar structures who will keep telling themselves and others, if not the whole world, that they have another "only friend in the Vatican, that we just have to watch and be patient." As pointed out yesterday, "Pope" Francis has already dispensed with what little remains of true papal ceremony as he is an egalitarian. He has told his apostate brothers in the conciliar college of "cardinals" to do the same. Why not dispense with the pretense that "differences" among religions matters? 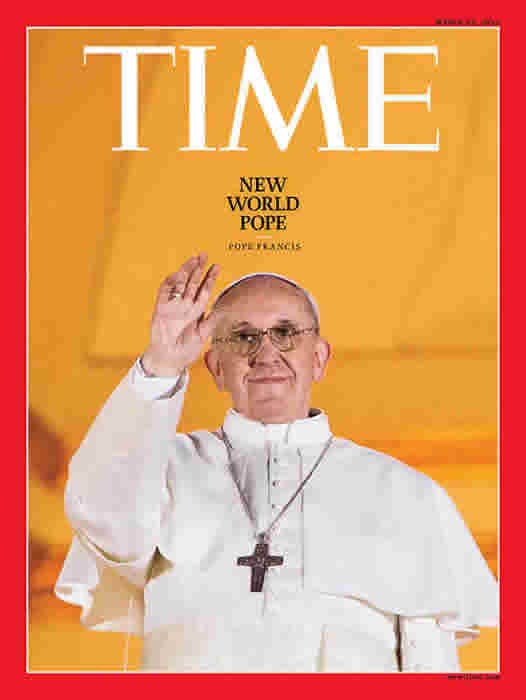 "New World Pope" for a New World Order. Head Citizen of the World. That's Jorge Mario Bergoglio/Francis. The Head Citizen of the One World Ecumenical Church is receiving plaudits from the World Parliament of Religions that held that hideous "parliament" at the Chicago World's Fair in 1894 at which James Cardinal Gibbons, the arch-Americanist who was the Archbishop of Baltimore from 1877 to 1921, as a champion of "dialogue," which, of course, is near and dear to the very ethos of Judeo-Masonry. Pope Francis has had deep experience in interreligious relations in Argentina. He co-authored a book with Rabbi Abraham Skorka, Sobre el Cielo y la Tierra (On Heaven and Earth, Buenos Aires: Sudamericana, 2011; e-book: Random House Mondadori, 2011). Regarding interreligious discussions, then-Cardinal Bergoglio wrote: “Dialogue is born from an attitude of respect for the other person, from a conviction that the other person has something good to say. It assumes that there is room in the heart for the person’s point of view, opinion, and proposal. To dialogue entails a cordial reception, not a prior condemnation. In order to dialogue it is necessary to know how to lower the defenses, open the doors of the house, and offer human warmth” (my translation). In response, Cardinal Bergoglio replied: “I am totally in agreement on the question of humility. It pleases me also to use the word ‘meekness,’ which does not mean weakness. A religious leader can be very strong, very firm without exercising aggression. Jesus says that the one who leads must be one who serves. For me, this idea is valid for the religious person of whatever religious confession. Service confers the real power of religious leadership” (my translation). "Service confers the real power of religious leadership"? This is madness, utter and complete madness. Istanbul (AsiaNews) - The Ecumenical Patriarch of Constantinople Bartholomew I will attend Pope Francis's inaugural Mass. The Ecumenical Patriarchate Press Office informed AsiaNews about the decision, noting that this is the first time such an event occurs since the Catholic-Orthodox split in 1054, an important sign for Christian unity. Why wait for Assisi IV in Assisi when you can have it in your own backyard? On the first day of his papacy, Pope Francis reached out to Rome’s Jewish community and said he hoped to build on the good relations between the two faiths. The city’s Chief Rabbi Riccardo Di Segni has accepted the new pope’s invitation to attend his inaugural mass. “The Vatican is present in that region. It’s involved in the conflict and not as a neutral entity. But if it’s able to hold reasonable talks with a peaceful will, then it’s welcome,” Di Segni told euronews. Just a stone’s throw from the Vatican, the Portico d’Ottavia district is at the heart of the Jewish community. The Jewish community in the Italian capital is considered to play a guiding role in Catholic-Jewish relations worldwide. VATICAN CITY — Like his predecessor, Pope Francis reached out to Rome's Jewish community at the very start of his pontificate, pledging to continue to strengthen the increasingly close ties between Catholics and Jews. Although online posting at a delusional Motu site contended that the new "pope" is to commended for his "simplicity of preaching," the simple truth, however, is simply that this is all the stuff of Antichrist. What did Our Lady of La Salette say about all of this? Rome has indeed become the Seat of Antichrist. This is truly remarkable to behold. However, this has been coming on for centuries. The Mystical Body of Our Blessed Lord and Saviour Jesus Christ is indeed mystically buried as she awaits her Resurrection. In the meantime, of course, we must suffer as we cleave to the totality of the Catholic Faith without making any concessions at all to this madness masquerading as Catholicism. I was just ruminating about Francis asking his fellow countrymen to donate to the poor instead of coming to Rome to honor The Pope. Reminds me of Judas begrudging the woman the cost of the ointment with which she honored our Lord's feet. I wonder when the For Sale sign goes up in front of the Vatican. Quite correct, Mr. Heimlich, except, of course, that the Argentines would not have been coming to Rome to honor true pope, and the fact that Jorge Mario Bergoglio/Francis is telling them not to do so is yet another piece of boldness on the part of the devil as he tells us, "Look. He's not the pope. You don't have to honor him. He is not a monarch. He's just Francis the Head Citizen of the One World Ecumenical Church." The fact that so few people see this is, humanly speaking, very frightening. We must cleave to the Catholic Church, not to the counterfeit church of conciliarism, as we attempt to plant the seeds for the triumph of the Immaculate Heart of Mary as the fruit of the fulfillment of her Fatima Message.